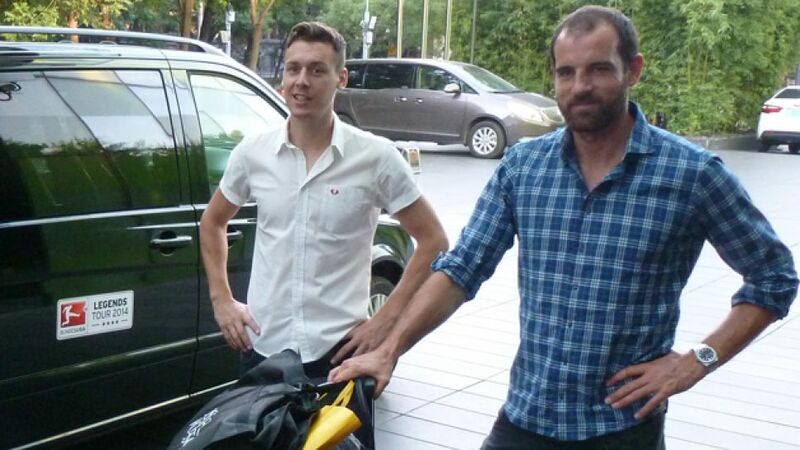 Beijing - Former German top-flight defender and 2002 FIFA World Cup finalist Christoph Metzelder has touched down in Beijing ahead of the first ever Bundesliga Legends Tour. The former FC Schalke 04, Borussia Dortmund and Real Madrid CF centre-back landed in the capital of the People's Republic of China at 5:15 am local time on Wednesday and is due to partake in a host of media and PR events as a representative of the Deutsche Fußball Liga GmbH. Metzelder is set to be interviewed as part of the production of the country’s most popular football show “Total Soccer” on the nation's main sports channel CCTV5, as well as appear at a press and PR breakfast event and a meet and greet session with fans. The Haltern native will also participate in a social event at Huangzhuang Primary School for children born to migrant workers, to be arranged in partnership with China's biggest charity, the Soong Chin Ling foundation. Now a working as a pundit, Metzelder was a pitchside reporter at the 2014 DFL Supercup between Dortmund and FC Bayern München and co-commentated the opening match of the 2014/15 season, when the Bavarians beat VfL Wolfsburg, for the Bundesliga's international TV partners. The 2002 league winner, one of several German football stars representing the top flight on the Bundesliga Legends Tour, won 47 caps for die Nationalmannschaft during his career and was named in the Germany squad for the 2002 and 2006 World Cup finals. He was also part of Joachim Löw's 23-man selection for UEFA Euro 2008. He retired from playing after a 14-year playing career in 2013, before making a switch into media and punditry work.